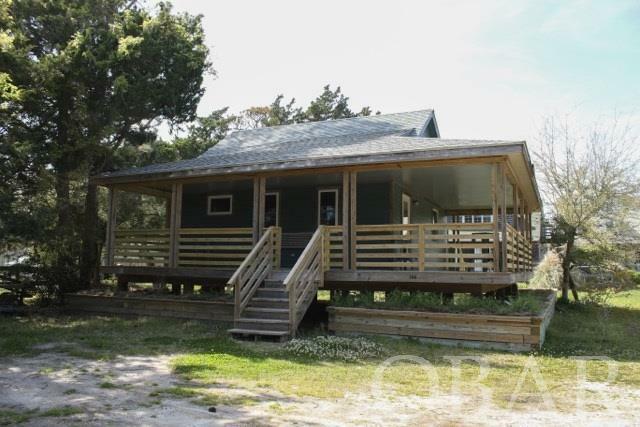 144 Lighthouse Road, Ocracoke, NC.| MLS# 100109 | Outer Banks Homes For Sale, North Carolina Home Search Including Nags Head, Pirates Cove, Manteo, Kill Devil Hills Kitty Hawk, Southern Shores, Duck, and Corolla North Carolina, Oceanfront and Soundfront properties for sale and long term rentals. This was originally a fisherman's net house, now it's been completely rebuilt and ready for guest. The Chance Cottage has new structural and interior wood framing. With beautiful wood floors, knotty pine walls, smooth neutral sage green concrete counter tops, cedar lined closet, a tile shower, and a very large attic for a potential studio loft, The Chance Cottage has it all including a great location know as Windmill Point Ridge. It's centrally located so that it's within walking distance of the Ocracoke Lighthouse, restaurants, shopping, and everything that Ocracoke has to offer.